This weekend I have been busy making stuff from a ton of windfalls the my parents brought down the other weekend and trying to preserve some of the produce from our garden. I made Rosemary Jelly with all the Rosemary ‘branches’ which were lying along the floor. 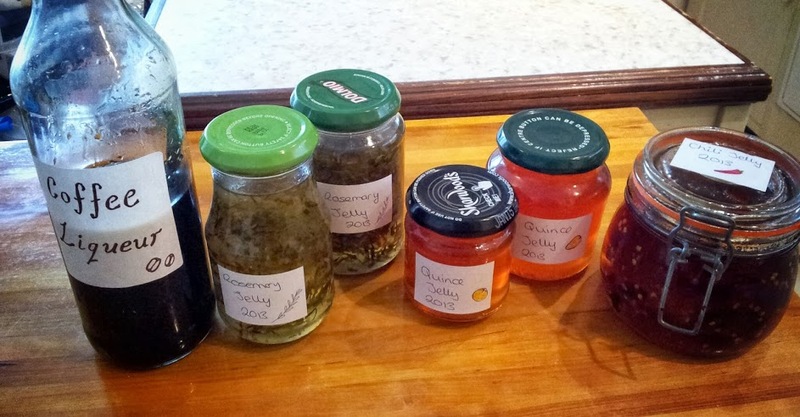 Chilli Jelly from some of the Chillies that have ripened on the plants and some dried ones from a previous year. I’m likely to have to move the plants inside soon to finish ripening the remaining fruit. Pretty… Lots of lovely labelled jars of goodness, I just now need to get into the habit of actually using it. I am making more Quince Jelly at the moment but this stuff is going to be with out the addition of apples to hopefully give a stronger taste.